Last week, the Raleigh Appearance Commission got a look at some new renderings for a hotel planned for the parcel of land near 500 Salisbury Street next to the convention center between Lenoir and South Streets. Long-time readers might remember this site being called “Site 4” and it looks like the renderings are getting more mature now. 6,455 square feet of retail/restaurant space compared to 7,085 sq. ft. previously. Most is the same including the second floor and rooftop terrace. As mentioned in past posts, this project will not add any more parking as a deal has been made between the developer and the city to lease spaces out of the Performing Arts Deck. 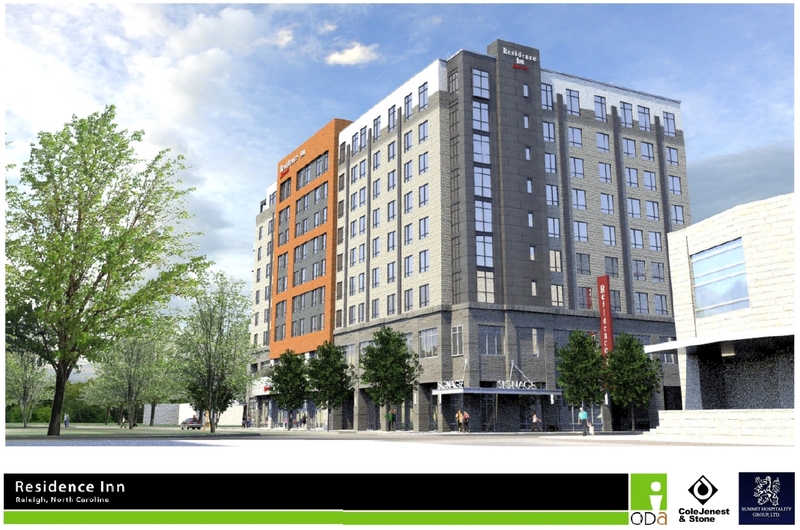 The project has a good human scale to it and expands downtown’s hotel offerings. I think this project is an easy one to support. While not architecturally significant, it’s more a functional addition rather than an iconic one. Looking forward to groundbreaking. The project is a nice human scale and easy to support, but the developer was selected on what they proposed, so they should have brougtht this exact design back at 11 stories then explained why they think 9 stories with less retail /restaurant space would work better at this location. ^Unique1 – YEAH! Why are we settling? I mean, when you have projects like the Edison office building or Charter Square, which were updated and are now being built TALLER than originally planned – what is this B.S. ? This design is better than the previous design. Yeah it may be shorter in height, but I would rather have an active downtown…..than one that just looks good from the highway. I thought 11 stories was not acceptable from the beginning. Bottom line, it is long overdue for Odom and Crowder to be voted out of city council (couple of out of touch council members). Crowder an architect!, that is funny, this guy has designed NOTHING of significance, he has absolutely no vision. Odom, this guy is a ancient relic, he votes down ALL substantial progress for OUR downtown. They are the order prevention desk on most projects. Public Safety Building is a great example, that should have proceeded forward with the original design. Summit is a small airport hotel developer, they are not qualified for signature projects in OUR downtown Raleigh market. It is the obligation of all our city council members to reject this hotel and demand something taller, is a quality structure (feel and look) with more retail space and a look that is iconic to OUR downtown Raleigh (all projects should have a urban, not suburban look to them). This is another Raleigh developer putting up a BOX (we are tired of the same looking boxes in OUR downtown – White Oak does the same thing – produces ugly structures). Though I’m also disappointed in the downsizing, I think 6,455 square feet of retail/restaurant space is reasonable for that lot. Architecturally, I don’t hate the building. Decent massing and interface on ground floor and materials are an improvement from the original proposal. Sure beats the blah looking Hampton Inn design for glenwood south. Come on y’all. It’s a hotel. Hotels are almost never skyline changers. There is little difference between the 11 stories versus 9 stories considering neither would have overpowered the City Center Marriott coming down Saunders. To echo, the south side is a great design with a high amount of articulation while the north side is a little bit of a snoozer but is complementary. Overall, the scale is spot on and will be a great transition into Fayetteville St. I can’t believe there are people who defend this project in ANY way. Site 4 is not going to see a skyscraper, but the area is a gateway to downtown and most definitely a way to make a statement. In this case the statement will be: “Welcome to Downtown Raleigh. The place where parking decks overwhelm their surroundings.” Before you call me crazy think of Edison Apartments, Citrix, Convention Center and the latest incarnation for Site 4. The new design is an improvement over the previous one, but the height is nothing less than a loud slap in our faces. Such a prime location should get nothing shorter than 15 floors. At this point I hope that one of the following is going to happen: 1) Developer can’t get financing for this crap. 2) Developer realizes the potential and proposes something taller. 3) Developer partners with another developer and either builds a taller structure or develops half the site (with a taller building). At this point, the latter should be a possibility. Empire Properties proposed something similar right before they cancelled the plans for their [outstanding] Lafayette Building. Let’s give these guys half the lot, let them build a 15-20 story building and keep the other half of the lot for another similar project. @Jake Anthony: The projects you mentioned actually support this developer’s notion that a scale down is fine. Edison Office Bldg went from 39 floors down to 13 and if we are lucky they will add 6 floors of parking, although the city said it is not necessary. Charter Square (South Tower) went from 15 floors to 11 floors. Sure, the building will be a little taller in overall height, but the floor count was reduced. Even worse, the 7-story Edison Apts will replace a 39 and a 28 floor tower. Summit Hospitality could easily use these projects as examples of scaling down patterns. More importantly, what does the WEST side of the building look like? If anything like the Marriott, this developer (Summit) should be walked out of the city! We the PEOPLE should have a panel of representatives (at least 4)who should be able to vote on all projects associated with OUR downtown. We should be sitting next to city council (especially the three who have NO vision: Odom, Crowder and Bonner). I second everything Ernest said. I want to be interested and excited about all the new things being built. It’s just a little hard to do that when 3/4 of the buildings that are under construction are scaled down projects with little to no architectural merit. I understand and agree with the disappointment that many are expressing, but I guess if you’ve lived in Raleigh long as long as I have, your level of expectation has been lowered. There are many things exciting about this building. First, it’s not designed by J. Davis. Second, it’s much needed hotel rooms for our convention center. 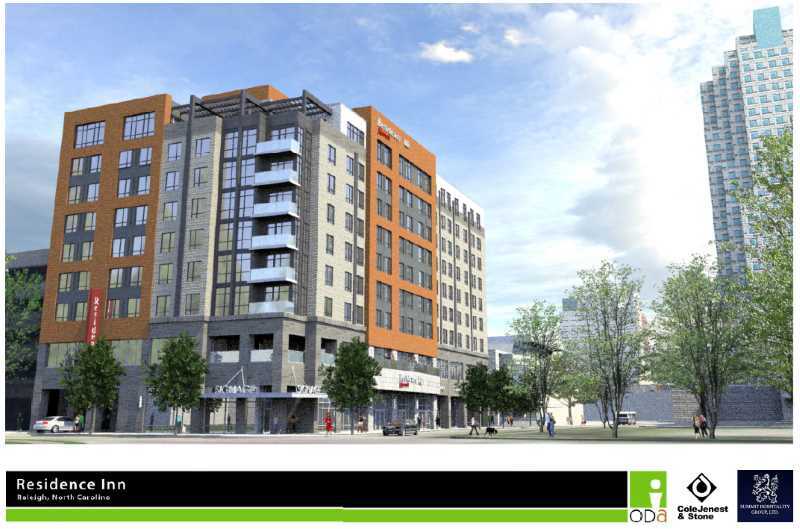 Third, this design is much better compared to most buildings in DT Raleigh. Yes, I’m disappointed that it is not the original 11 stories, but I like this 9 story building much more than the ugly 11 story proposal. No doubt, this isn’t the dream building for this site, but compared to the other stuff going up, this will be a welcome addition. And did I mention that at least it’s not designed by J. Davis. While it’s nice that downtown will be seen some additional hotel space, it would be nice if the city would require more architecturally inspiring designs. Raleigh can do better. The city can’t dictate architectural design. They can “influence” but the minute you start telling a developer he has to be “x stories” or it has to look like “my personal opinion” of what a good architectural design is, the pool of potential developers leaves for another town. Demand-side economics will drive height and style in Raleigh. The only exception is city owned land which of course the city can “influence”. The same rule applies. developers will run for the hills when you impact their profits margin too extensively with your “opinion” of what a building should look like or it’s height when you are not ponying up the money to do so. When downtown has a couple more corporate relocations, watch what happens to the heights and styles of buildings. One more point, if you can vote the crazies out of jones street, Raleigh will not be impeded but moronic legislation like the one currently being proposed to restrict when Raleigh could offer a voter referendum (not arbitrarily raise taxes by the way) on education and transit. It is idiotic legislation clearly designed at hindering progressive growth in North Carolina’s cities. So much for “limited government”…..
first when the hotel plans are reviewed as long as they meet building code city staff can’t dictate how it looks or number of floors. The hotel will greatly improve the convention centers ability to bring in larger conferences which will improve the chances of more offices and a larger hotel. Until the Hurricanes move downtown in their own facility then downtown will be just bars and food truck rodeos especially when North Hills is starting a new 18th story office building and other projects. Kane is kicking it just watch how Stanhope makes Hillsborough Street look in a year!!! I also think there are more crazies on Hargett Street than Jones Street considering blowing 12 million on Moore Square, 7 million on bus station while increasing fares and 300K on a temporary feeding station for the homeless. Mr or Mrs Developer, please ignore the fact that you are pumping in a 23M investment and providing much needed rooms so the convention center can host larger, high profile conventions (which equates to more $$ and ground activity). However, we don’t like the fact you are not adding to our skyline. Please proceed to Charlotte considering height trumps everything in the city of Oaks. It appears to me that the rendering indicates a primarily brick facade instead of synthetic stucco. If true, that’s a tiny improvement. That said, I agree that the overall design feels way more suburban than urban. It’s easy to imagine this hotel sitting near O’Hare airport in suburban Chicago. I admit the Design looks great But why low rise buildings. Granted that it will fit well do to its location and space, But you need a Hotel that will accomindate lots of Visitors.15 to 20 stories sounds better. Raleigh is just to spread out,and bringing Business and residents to downtown raleigh will bring life to the Downtown. Just something to think about: When the site belongs to the city, and RFP process is in place. The city leaders can “dictate” what they want to see, both in terms of size as well as architecturally. Not all the fine details, but they can “force” a developer to build something at least 15 floors tall – which could still be small. If they say “we want to see at least 300 rooms”, the developer will be “forced” to go vertical. For those who think that the developers are doing us a favor by investing in our downtown, keep in mind that they receive a lot in return, like parking spaces (at good rates), steady flow of customers through the conventions and a prime location where they can build – mostly paid for by taxpayers, both individuals and businesses. I appreciate the risks they take, but prime locations deserve high profile projects. @BC: Amen to you brother for speaking the truth in your last sentence! Hargett Street is far scarier these days, but not many seem to realize it. FYI, the only other hotel to be built in the downtown core recently (Marriott) was highly subsidized (city gave $20 million). Meanwhile 2 new ones are currently being built at Crabtree. Should tell you something about developers’ desires to bring hotels to downtown. This hotel is great for downtown! And the design is good. Unless the city wants to chip in a couple million dollars to add 2 more floors to the building then I guess the few loud internet complainers will continue while the vast majority will applaud the positive effect this will have on our downtown and economy. My point was not that the City could or could not dictate height and design but that the minute you push too hard, the developers walk away and the property sits vacant. If it’s such a great site for a high or mid rise building, why ha we seen absolutely NO proposals for such? You haven’t ask this question. Having Raleigh start trying to mandate the height and we are potentially having the same conversation 5 years from now. As for Hargett versus Jones, I challenge you to article lunate how the City’s plans for Moore Square and the bus station will not generate an ROI of 5X. On the homeless problem is solved in Moore square, watch the development that occurs around that site. Hell, I sound almost like a republican with a statement like that. Please describe how either of these benefits Raleigh and Downtown, the primary point of this site? Typing from am iPad. Excuse apples “spell check”. Again, this lot is sort of tucked away from the main downtown stage of Fayetteville St, so I’m not as disappointed with the downsizing as I would usually be. Plus, the design has improved and has a decent pedestrian interface, which I think is more important. Now if this was the second tower for Charter Square or something prominent like that, then I would sh*t a brick over the lack of height. Especially any building that contributes to the South Dawson St view of Raleigh’s skyline that is featured everywhere. The building’s fine, especially for that corner. It will at least continue the feeling of actually being downtown further than Charter Square. Right now the commute through that awful parking lot to the auditorium makes you feel like you’re in the middle of nowhere. My only issue with the proposal is the side facing McDowell St. and our money shot is going to be almost completely blank. @Uncle Jesse There was a high rise proposal for this site. It was a 23 story hotel called Lafayette. It was proposed by Greg Hatem just before the bottom fell out of the economy. I’m with Squirrelchat. If it was Charter Square North tower being cut down. I would s*** enough bricks to build the two extra floors on the Residence Inn. It’s an ok hotel that we need. Two more should be coming soon. I think by The L? Let’s hope they are better. Finally Some Growth to Downtown,Just Wondering where Tower 2 of Charter Square is going to be built..across the street next to the Lincoln Theater that would be a great spot for the taller tower. Finally seeing some life in Downtown, lets just hope that this growth continues. Would love to see Improve Transit, late night service to CAT BUSES wouldn’t hurt you do have folks that work past 5 pm. Mark^ – Tower 2 will be right next to Tower 1, on the North side. I’m not sure if anyone really knows at this point. But what is Charter North going to be? Offices, Condos, or my favorite a hotel. Yes I’m dreaming lol! Maybe a combo of the three? Hoping for a WESTIN or W!!! Yes still dreaming!!!!! I’m Dreaming too…nothing wrong with Dreaming. Westin Hotels would be pretty cool.It would of been nice if it was built near Crabtree But we all know what happened to that. Can anyone say….Soeil Center, Ok I can’t spell…sue me. Well, right, that’s just what we’ve been told. Would be cool if they built it right next to Tower 1 as planned, and then put some walkway bridges between the two towers! You know what? Looking at the renders of the original (11 story) plan, and looking at these ones – it seems like this new plan is MUCH wider, actually built right up against the parking deck, with the pick up/drop off in the same place as before, just with a tunnel and more building up above it (if I’m making any sense at all). So it may be shorter, but maybe there won’t be a downgrade in the number of rooms! Plus, it is MUCH better looking than the previous design. Not that it couldn’t look better (our downtown could use more iconic architecture like the SECU building), but it’s definitely an improvement. I guess my main complaint is the downsized retail/restaurant space available in the new design. This rendering is MUCH better than the original airport looking hotel (that was embarrassing). It still needs to look more Urban. Can we please break away from the box looking building with flat tops! Then again, no REAL Urban building developers in Carolinas. Are there any renderings of the hotel that is suppose to go up across from that ugly L Building (Empire Properties is a joke! – by the way, we should not use the Lafayette Hotel as an example vs The Residence Inn – Empire NEVER planned on building that – they have no clue how to build in downtown Raleigh – example (The L (Loser) Building). You have no idea, Jerry, NO idea! Serenity now!!! Raleigh is a small town and everyone wants it to be big….. Why??? a more relevant question might be why you chose obama as a name to post your views. regardless, raleigh is not a small town. it is a failed capital city that has recently turned a corner, and most residents are glad to see it. as someone (one of many) who chose to move here from somewhere else, i see the potential and the action in Raleigh, and it makes me excited for my adopted hometown. i don’t want it to be new york, boston, chicago, or god forbid detroit. or charlotte. i want to see raleigh excel at smart, clean, local, urban development. judging by the numbers, i’m not alone. Raleigh is it’s Own City. it is Not New York,Boston,or Chicago. I wish that folks Stop comparing the two cities. Raleigh is a Growing city with many possibilities,it is a small city compare to others but has it’s own identity. I admit it is a much slower pace than what Im used to in NYC but love it nonetheless. I too miss the tall skyscrapers of Manhattan,But aside from the congestion of traffic and noise,I do not miss it one bit. I’am very happy with the growth Raleigh has become and will continue to grow with more Hotels and Offices Downtown and other ammendnetties…Ooppss.! hope i spelled that right. (sorry).We all have wishes of a Bigger Downtown and that is not a bad thing, but lets just take it One step at a time…guys. Hmmmm Raleigh a small city?…..420,000+…not that small. I believe we are classified as a Midsize city (midsized?) – either way, no, we are definitely not a “small” city. And we’re definitely headed in the right direction of becoming a “big” city, probably a lot quicker than most imagine. Over the past 6ish years that I’ve lived here, I have watched Raleigh really start to grow into it’s own little identity, and that identity just gets stronger and stronger with each year. With the ideas presented in the new 10 year plan, we will soon become as unique a city as Austin, TX – even Portland, OR. Big things are coming! Most classifications have Raleigh in the ‘large market’ category. obviously, we are not in the NY-LA-SF category but Raleigh and Wake County are over 1MM and will soon be the largest county in North Carolina. Here are two such ‘ranking’ from last week. In fact as of 9.27.14, Raleigh Durham has slipped a spot to Market #25, and Charlotte is #24. Thinning ranks in the US Army around Fort Bragg (which is included in the market measurements took some households out of the market. Largest, Fastest, those don’t matter so much to me. The important thing is that Raleigh transitions into a major city without sacrificing its character, but instead using the growth to supplement it… failing to do that is a mistake other fast-growing cities made which we can learn from.